Hitting all the right notes, The King’s Singers bring classic holiday songs to life in gorgeous harmony. For the last 50 years, the group has become internationally renown for their “voices of spun gold” (BBC Music Magazine). Born into a family of musicians, Patrick started learning piano and singing at the age of five- later becoming a a chorister at Hereford Cathedral. Developing a passion for choral music, especially early music, he remembered hearing Robin Tyson (King’s Singer from 2001-2009) as a soloist and was mesmerized by the countertenor voice. Fast forward to January 2016, Patrick was appointed to The King’s Singers after two tough rounds of auditions. Timothy’s musical journey began as a boy chorister at Chelmsford Cathedral at the age of six. Surrounded by magnificent choral music and singing, he later found his voice as a countertenor. He received a vocal scholarship for postgraduate study at Trinity College of Music in London and in 2006 became an Alto Lay Clerk at St. George’s Chapel at Windsor Castle. Two years later, he was invited to audition for The King’s Singers and has been touring with the group since 2009. With a choirmaster and organist father, Julian spent a lot of time in church and joined St. John’s College Choir at the age of six. Developing a passion for violin and piano, he applied for a musical scholarship to Eton College and spent several years performing and learning German though an intensive exchange program where he made friends around the world. In 2014, Julian was invited to audition for The King’s Singers. After his performance, he was immediately offered the tenor position. Watching the choir of Christchurch Cathedral proceed down the isle in December 1994, Christopher whispered to his Mum and Dad, “I want to be in that choir.” Then, after 15 years singing in that very choir, he moved from New Zealand to England to pursue his lifetime ambition of becoming a professional singer. In January 2012, Christopher made his King’s Singers debut and has loved the journey aver since. 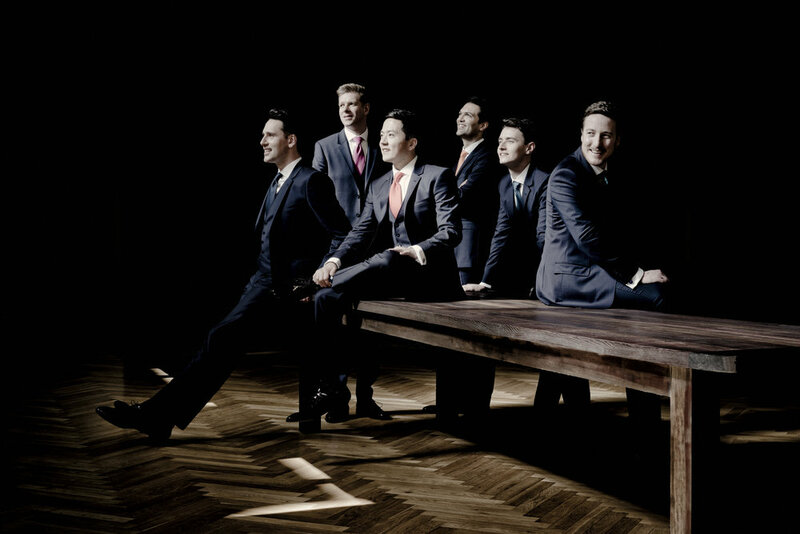 Traveling the world with his music, The King’s Singers has given Christopher opportunities that he’s only dreamed of. Having been a part of The King’s Singers since 2004, Christopher celebrated the 40th Anniversary of the group back in 2008 and is thrilled to celebrate 50 years of the choral group. In an incredible 14 year career, Christopher has performed over 1,500 concerts. Famous for an inability to say no to anything, Jonathan’s life has been defined by learning more subjects than necessary, more instruments than were sustainable and doing more activities than could be squeezed into any normal timetable. In his eighth year as a King’s Singer, he still finds ways to spread the joy of music, travel around the world and enjoy a game of backgammon. Excited for the future of the choral group, Jonathan believes that there’s never been a more exciting time to be one of The King’s Singers as the group celebrates its 50th anniversary and tours the globe.